Keto pancakes?! You read that correctly! 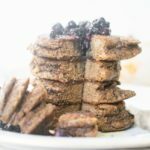 Using pastured eggs, a collagen-based protein supplement that is only sweetened with stevia, and a little coconut flour, these fluffy chocolate pancakes with blueberry butter will satisfy your appetite and fit into your macros. Here’s another delicious keto-friendly breakfast! Wild blueberries, which are usually found in the freezer aisle are actually more nutrient dense. Forager tip: the smaller the blueberry, the more nutrient dense. Wild berries tend to be smaller than their farmed counterparts! Set a large cast iron skillet to heat on medium heat. In the meantime whisk the MCT oil and the eggs together. Add in the coconut flour, protein, baking soda and pinch of salt. Mix until smooth. The batter will be thick. Once the skillet has come to temperature add the tablespoon of butter. Pour the batter on to the skillet. Will make 4 2/3 cup pancakes. Cook on medium heat for 4-5 minutes a side. These bad boys will be tall. After you flip them once, flip them again and gently press down a bit to make sure the middle is fully cooked. Remove from heat. In a small sauce pot, add the blueberries, cook until they thaw and the fluid begins to simmer. Add in the butter and mix and mash until the blueberries are completely softened. Serve your pancakes and spoon buttery blueberry mix all over them. Enjoy! What do you mean as served? How many pancakes and what size? Is this into chart for the entire batter ? Hello Gail! Recipes makes 2 servings, macros are PER SERVING. Been on Keto diet for 2 weeks now. I thought I was suppose to keep carbs at no more than 20g per day. With these recipes, I would go way over. Explain, please. Never mind, I just read wrong. Thanks! I have flavorless collagen protein powder, how would I make this work? Could I add cocoa powder? Hi Tawnee, you can mix your Keto Collagen Protein powder with smoothies, drinks, or coffee to make it taste better or you can try adding it to your favorite recipes.